Yoko McCann: SYTYCD Recap: Top 10 & All-Stars! 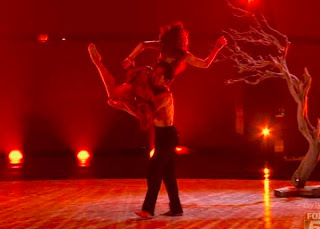 SYTYCD Recap: Top 10 & All-Stars! SO excited for the reveal of the All-Stars. I resisted the temptation to look up who they would be in advance so they better not let me down! How could they though, really? Eleven lifts! Eleven!!! I still think TIffany was lucky to get in the Top 10 over Amelia or Janelle, but she definitely gave an exciting, energy-filled performance. I still wouldn't pick up the phone to vote for her. Witney dazzled next to the inaugural champ on a piece by Travis Wall. She'll dazzle her way through to the finale, I imagine. Cat referred to Cole being slightly injured at the top of the show but the judges didn't say anything more about it and he definitely didn't dance like he was hurt. This wasn't my favorite Cole performance, but his cha-cha moves impressed my amateur eye anyway. That was fun! I enjoyed that very much. I think my problem with Lindsay is that she reminds me of somebody I don't care for very much and that's certainly not her fault so I should try to get over that. I completely understand Uncle Nigel's inner battle about wanting Will to calm down a little bit but also loving how much personality he is able to infuse into his dancing. Love him, but would like to see a choreographer challenge him with something more mature soon. Cyrus? Contemporary? Travis Wall? I'm worried. He definitely has storytelling down, and his partnering ability seems to have come a very long way. It definitely wasn't perfect (that leap, not so great) but he has really proven he deserves a spot on this show. But does he deserve to stay over these other guys? That I'm not so sure about. First of all, Lauren is one of my favorite all-stars. Love her. Second, does Chehon have a great smile or what!? Am I just noticing this or has he not really been smiling much (I guess it must be the latter, based on Nigel's comments)? Third, this lyrical hip hop choreography definitely favored Chehon over something more hard-hitting, and it was lovely. Poor George. I don't know about you, but I watched Allison the whole time. I'm sure he did a great job. Nigel, you're disappointed? MAYBE YOU SHOULD HAVE SAVED MATTHEW OR DAREIAN (PROBABLY MATTHEW). As J-Lo would say, goosies!!! My favorite of the night. Plus, I just love her hair. Loved the concept! I have to agree with Mr. Natalie Portman though- Audrey danced like she was #2 to Twitch, and who can blame her? How could Witney and Chehon be in the bottom!? At least there was no suspense going into the eliminations. You know that Audrey and George knew they were dunzo. I'm sad about Audrey, but the judges really should have gotten a clue about George earlier (he has does an amazing solo each time though- especially tonight- I'll give him that). Thinking back, I think you could have guessed from Nigel's comments who was in trouble tonight. I'm going to have to play that game next week. Oh yes, next week... because the finale needs to be Witney-Eliana-Cole-Chehon, I guess that leaves Lindsay-Tiffany and Will-Cyrus as who I think should be the bottom four dancers. I hate to say it, but it's time for Cyrus to go. Having said that, I'm not sure he'll be in the bottom- I think we may see Cole slip in there with his so-so cha-cha (see what I did there? ).